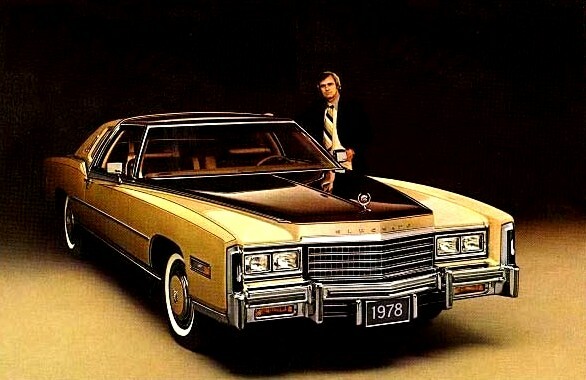 1978 would be the final year for the full-sized Cadillac Eldorado. Demand for more fuel efficient vehicles led General Motors to down size most of its line for 1977, and that left just two of its personal luxury models—the Oldsmobile Toronado and the Cadillac Eldorado—to be down sized. (Buick's Riviera was restyled in 1977 and became a mid-sized car.) New smaller versions of the Toronado and Eldorado would happen for the 1979 model year, which meant 1978 would be the final opportunity to buy a new full-sized car from GM. For the 1978 model year, Cadillac initially offered three Eldorado models: the Coupe, the Cabriolet, and the Custom Biarritz. To commemorate the final full-size Eldorado, Cadillac Division introduced the Custom Biarritz Classic very late in the model year. The Custom Biarritz Classic was identical to the Custom Biarritz, with the exception of duo-tone pillowed leather interior in Light Beige and Dark Saddle, Dark Beige Leather steering wheel jacket, duo-tone exterior finish in Arizona Beige with Demitasse Brown Metallic accent on hood, doors, and roof, Dark Brown accent striping, and gold-plated "Biarritz" script on the sail panel and deck lid. The 1978 Eldorado in base trim had a wheelbase of 126.3 inches, weighed 4,906 pounds, and had an overall width of 224.1 inches. Truly, a significant automobile. Power was provided by a 425 cubic inch V-8 engine with a compression ratio of 8.2:1 and a horsepower rating of 180 at 4,000 rpm. Driven carefully, this car can get double digit fuel mileage in town, and in the mid-teens on the highway. Cadillac built 46,816 Eldorados for 1978, and 2,000 of them were the Custom Biarritz Classic model. There were other reasons for the Custom Biarritz Classic besides Cadillac's desire to bid farewell to the final full-sized cars with a special edition model. Lincoln was celebrating Ford Motor Company's 75th Anniversary in 1978 with the Continental Mark V Diamond Jubilee Edition, which had been available since the 1978 model introduction, and was selling briskly. Also, Cadillac knew that the final full-sized Continental Mark V would be built in 1979, and a special Collector's Series model based on the Diamond Jubilee Edition was planned for that model's final voyage. This meant if Cadillac were going to provide a proper send off to the Eldorado, they'd have to come up with something quickly. It hardly seemed appropriate to allow the last full-sized Eldorado to slip quietly into oblivion without so much as a special edition, but that's exactly what Cadillac had initially planned to do. This decision was made because Cadillac had hoped to avoid the speculative buying that accompanied the last Eldorado Convertibles in 1976. Many collectors had purchased one of the last convertibles and placed them immediately into storage as a future collectible. This made convertibles difficult to come by for some of Cadillac's customers, so the decision was made to not make a big deal about the final full-sized Eldorado. But that could hardly be allowed with rival Lincoln making such a fuss over its final Mark V.
Since very little time was available for the Custom Biarritz Classic project, Cadillac Division turned to American Sunroof Corporation (ASC) in Southgate, Michigan. ASC would be able to modify standard Custom Biarritz cars quickly, turn them into Custom Biarritz Classics, install a sunroof or Astroroof if ordered, and return them to the Cadillac assembly facility for shipment to dealers. The entire modification process took about 5 days, start to finish. In its announcement, Cadillac stated that "various components of this custom option are installed 'off-line'; therefore, a minimum of five (5) days will be added to the normal production time." Cadillac began the process by assembling a Custom Biarritz finished in Arizona Beige (paint code 62), with a matching Light Beige Cabriolet Elk Grain vinyl roof (code T) with smaller rear window and French seam roof/window treatment. A special duo-tone pillow-style leather interior (trim code 644) was installed (shown above and at right), which featured a Dark Beige instrument panel, steering wheel and column, and leather jacketed steering wheel rim. Dark Beige carpeting on the floor and lower door panels highlighted the Light Beige vinyl door and rear quarter panel trim, headliner, roof moldings, and seat side bolsters and center panels. Dark Saddle Sierra Grain Leather with Contoured Pillow Style Seating (shown at right—click image for larger version in new window or tab) featured Light Beige piping. 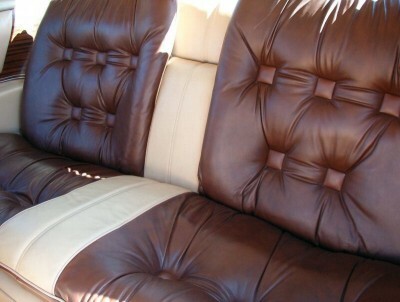 This interior was unique to the Custom Biarritz Classic model. The partially-completed car was shipped to ASC for modification and completion, where the Demitasse Brown Metallic paint was applied to the center section of the hood, upper sections of the doors, and the forward section of the roof. A supply of exterior moldings was stocked at ASC to be installed after completion of the paint process. Dark Brown accent striping was added as the last step, a final distinctive touch. ASC also installed sunroofs in 500 cars. A sticker was attached to the driver's door lock face, above the latch, which indicated the car had been modified by ASC, met all Federal Standards, and the date the work was completed. The ink used on these stickers was not stable, and many have either faded or are so washed out they are difficult to read today. Actual production time at ASC was four to six hours, depending on whether or not a sunroof was to be installed. Once completed, ASC inspected each car and shipped it approximately seven miles back to Cadillac where it was processed through normal channels to be shipped out to Cadillac dealers across the country. All in all, this was a very efficient process and allowed the cars to be available to the public in record time. The 1979 Cadillac Eldorados that followed would be smaller and more fuel efficient. Built on a 13-inch shorter wheelbase, the '79 Eldorados would also lose 10 inches in length and would weigh in at 3,792 pounds, a reduction of over 1,100 pounds! The 1979-1985 Eldorados were very popular, and sold well. And while they were all distinctive and elegant, with efficiencies demanded at the time, they would not have the presence of the 1978 Eldorados. The good news for those interested in purchasing one of these cars is that there are plenty of them around. Most original purchasers realized the significance of the final "big" Eldorado, and lavished extra care upon it. Most have held up well over the years. These cars are dependable and a joy to drive. Fuel mileage is not great, but if driven carefully most will find they can live with it. Check the front and rear bumper filler panels for deterioration. Reproductions are available, but they require much time and attention to get a perfect fit. Rust can be an issue on these cars, especially around the base of the vinyl roof. Check this area very carefully, as the heavily padded top can hide a lot of damage. Not everyone is in love with the duo-tone paint treatment, but it is representative of the era in which it was built and many find it interesting that Cadillac pushed the margins of good taste so close to the edge with this model. Others find them to be especially beautiful because of the extra glitz they provide. Few cars over the years have been as luxurious, as quiet, as comforting, and as beautiful as the Eldorado Custom Biarritz Classic. If you're seeking distinction, this is your car. We promise you will get noticed! And we promise you will enjoy every mile behind the wheel, knowing that you are commanding one of the final full-sized luxury cars built by America's luxury leader, Cadillac. 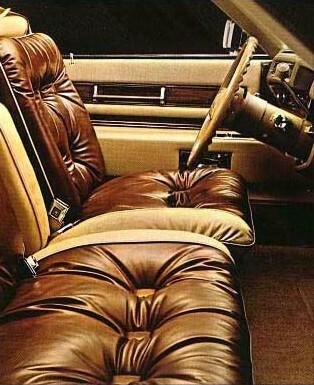 Once you own an Eldorado, it's difficult to accept anything less.